I’m sure I’m not the only one who is more than a little disappointed at the lack of playable game content to celebrate 20 years of Tomb Raider. It started me thinking of an idea for a friendly ‘competition’ or project to celebrate 20 years of Tomb Raider! Despite all the awesome HD levels being built, I’m very partial to nostalgic levels created using the original texture sets, and there aren’t that many good ones being created these days. I propose a ‘competition’ to create classic levels using the original textures and WADs. Anyone can join in, all you need to do is create a nostalgic level of at least 30 mins worth of gameplay utilising the original textures, and make it look as awesome as possible! Use original textures from Tomb Raiders 1-5. Join at any time, as long as your entry is completed by November! A combination of any textures from the first five TR’s is allowed – e.g. Can use a mix of both TR1 and TR3 textures in one level. Base your level on an original WAD or combination of original WADs from TR 1 to 5; however you ARE allowed to include some custom non-original or modified original objects if they are in-keeping with the classic feel of the level. TRNG and FLEP are permitted - just maintain a classic feel! Here is my own WIP level entry; hopefully it may inspire some others to try! ^ Please let me know if I've missed anyone! UPDATE – Submission date Info! The Submission Window for levels will be 22nd to 30th November – please PM me a download link to a ZIP containing your completed and tested level files within that time window or before. Levels will then be released as a batch on trle.net early December. Each level will be an individual download, but in order to identify each level as part of this competition, I ask everyone to please download and use this special anniversary loading screen. 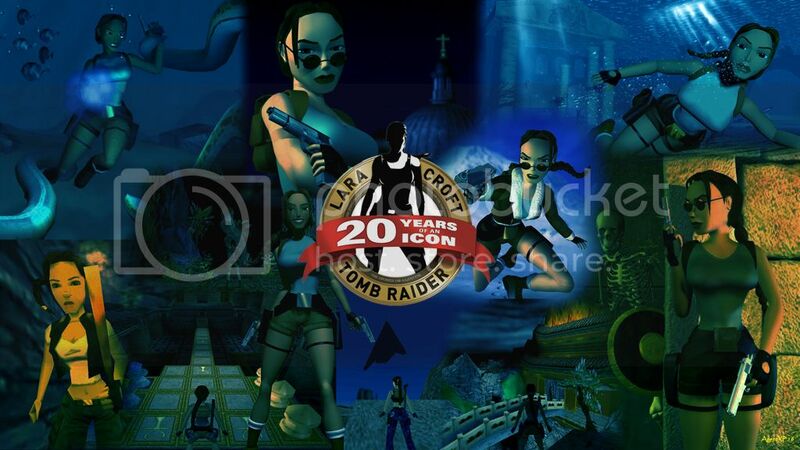 If you have already made your own custom loading screen, that’s fine, but please can you ensure that it features the Tomb Raider 20th anniversary logo!! Please include the zip with you level folder as well as using the load screen so that each player can chose the size they need! “Waiting is for the patient” (Croft, 2006). Last edited by AgentXP; 03-12-16 at 00:10. This level could also be used as inspiration but it is TR2 but I think some will get the idea. "I have a pretty damn good idea(.) Trust me. This ends now". for how nice those are. But those are very nice. I am DOING SOMETHING. DOING SOMETHING. About A SOMETHING right now... that just so happens to line up so very nicely with this. So. Allow me to go do a little tiny bit of research. I think. I will finish an entry for this friendly competition. Because it has come at such a brilliant time. The subject matter is always an illusion pretending to be what it is not. I'm gonna say screw it, I'll join Why not! No way! I was totally going to post a thread along these lines but with a much tighter challenge. I wanted to do it because I felt even with the NGLE technology I've been using the high res graphics to make atmosphere and not really being efficient with my gameplay so I toy'ed around with this "It's 1999" idea that with the basics to make a good level and capture the magic the originals had. I'm totally up for doing this. - Any TGA from the classic games. - Any WAD from a TR4/TRLE level. - This WAD may not be customised in any way UNLESS it's missing objects that make it incomplete. So every WAD should be allowed to have 1 switch, 1 key, 1 lever, 1 pole rope, 1 kick door, At least 1 bad person, 1 bad creature etc etc. If the WAD is missing said object, you may add one in. - Add any one gameplay feature from past games like zip line or pole rope or speedboat using NGLE but not gameplay feature that was only introduced with NGLE. It had to be a remake/variation of what the classic games were capable of. - Only use outfits from TR1-5 / Use revise wad Lara object for all animations. - Maybe let them change the horizon with any from TR2-5. That can be a tricky and restrictive one as TR4 is limited to only Egyptian skylines. - 3-5 "plants" or architecture objects from any classic game WAD can be copied in addition to what's included in the original WAD. - Free reign on Audio. Audio tech was pretty good in 1999. Can use MP3s etc. Last edited by GeekOfComedy; 05-07-16 at 23:01. I like this idea a lot. Could you enter more than one level?